Please Note: The stills used here are taken from the standard definition DVD from Criterion, not the Blu-ray edition under review. Many consider Max Ophuls' 1953 film The Earrings of Madame de... to be his masterpiece, and with the film's concise storytelling and unguarded emotion, there is certainly a case to be made for this being true. Adapted from a short novel by Louise de Vilmorin, it is an expertly tailored film. Not a hair is out of place, no word of dialogue or frame of film is superfluous. A melodrama of manners, a comedy of passion, Madame de... is a delicately balanced study of infidelity and the cost of loving amongst the upper crust in France in the early 1900s. 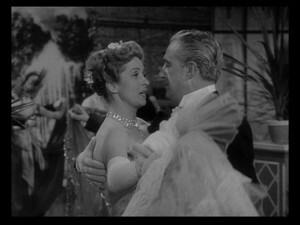 The Comtesse Louise de..., played by Danielle Darrieux, Ophuls' frequent go-to actress in his late French period, is a spoiled wife of a respected General (Charles Boyer), to whom appearance and formality is everything. In order to avoid a scandal, Louise resorts to selling a pair of diamond earrings her husband gave her for their wedding so that she can quietly pay off the debt she has accumulated through her extravagant shopping. She then fakes their loss during a night out at the theatre, which she thinks will be a simple solution to explaining their disappearance. Unfortunately, her act is too convincing, and scandal erupts anyway. The story goes around that the earrings were stolen, and it becomes all the talk of the gossip rags. 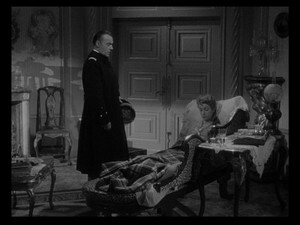 Fearing what will happen if he tries to sell these hot rocks, the jeweler (Jean Debucourt), goes to the General and tells him what happened. Shocked by his wife's deceit, but also unwilling to raise a fuss, the General buys the earrings back. He then hands them off to his mistress, Lola (Lia Di Leo), who is leaving France for Turkey; presumably, the General will never have to see the earrings again. Oh, how wrong he is! Like the proverbial bad penny, the earrings keep popping back up. An Italian ambassador, the Baron Fabrizio Donati (legendary Neorealist director Vittorio De Sica), buys the jewelry on his travels. As fate would have it, he is immediately smitten with Louise when he encounters her not once, but twice, on his way to his new post in France. Romantic feelings spring up between them, and in a twist worthy of O. Henry, the Baron gives Louise the earrings as a gift. Further lies are told to explain their reappearance, alerting the General to his wife's emotional wandering, and all manner of heck breaks loose. Playing up the comedy in the first act gives Ophuls license to play up the melodrama in the second, toying with the sudsier elements of "women's pictures" in a sly manner that allows him to put his characters and his audience both on an emotional incline. With the random encounters between the lovers prior to their social introduction, Ophuls emphasizes fate even more than de Vilmorin, suggesting that it can be treacherous and that coincidence is actually cruelly arbitrary. As we slide toward the climax of The Earrings of Madame de..., the situation gradually grows more serious, the comedy becoming a full-blown tragedy. Here is where Ophuls makes his one major deviation from the original text, downplaying the fourth sale and resale of the earrings--the jeweler is one of the funniest characters in the novel, benefiting from the constant trading of the same diamonds--and changing how the love triangle resolves itself. The filmmaker had always been interested in the differences in how men and women react to romantic tension, and Madame de... is no different. de Vilmorin stresses the importance of honor in the decisions both the General and the Baron make, but Ophuls takes it a step further. He lays the groundwork early by establishing a greater connection between the Baron's function as an ambassador and the General's military position. (Though the story is set long before WWII, the film was made after, and lines about friends and enemies could be read as a nod to where history would eventually take France and Italy.) Peace talks break down, and the General uses his rival's pacifism as an excuse to challenge him to a duel, thus sparing himself the public humiliation of having to admit that this man has privately wooed his wife. It's an interesting change because it takes the focus away from Louise and puts it on the male ego, whereas in the book she grows ill due to a broken heart and both men put aside their differences to honor her. Ophuls also lays a better groundwork for this with the fainting spells, which like the rest of his film, goes from being laughable to serious as the situation demands. When you think about it, that's also the nature of the flirtation of the Baron and Louise. The pleasure of conversation and innocent dances blossom into real love. The climactic duel makes sense within the context of Ophuls other work. He has always had a greater sympathy for his female characters than the male, and I would suggest that the theme that interested him most about Madame de... was the irony of how the men in Louise's life are perfectly capable of deceit--the General has Lola, the Baron is willing to commit adultery--but they demand total honesty from Louise. The General may say that he understands that everyone has secrets, but when he does so, he also insists that his wife dispense with hers. He never reveals his own affair and his own role in the travels of the earrings; neither does the Baron ever see the folly of putting his would-be mistress in the position of having to be duplicitous but then insisting that her duplicity be of a variety approved by him. It's no wonder Madame would become so fatigued! As in all of his films, Ophuls displays a tremendous visual sense and a control over his camera in The Earrings of Madame de..., though I would argue that maybe he's toned his style down some in comparison to La ronde and Le plaisir, which preceded Madame de.... Perhaps he was inspired by De Sica to keep it more real, but there are less sweeping shots or extended takes that call attention to themselves due to their complexity. One notable exception is the beautiful montage of balls and galas, where one dance between the Baron and Louise keeps fading into another, weeks disappearing in seconds as they fall in love. Part of this restraint, I think, is down to the nature of the movie's setting. The home of the General and Louise and the places they visit are so lavish, so ostentatious, to further glam them up with lots of cameraplay would be too much. 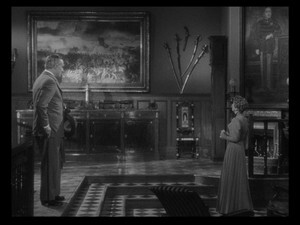 Instead, Ophuls frames the shots in such a way that shows off the grand sets and places his actors so that when he cuts between them, his compositions show the divisions that prevent them from being more intimate. 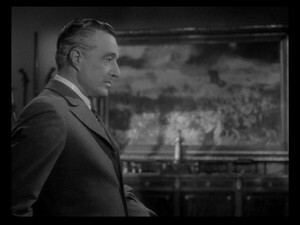 Look at the scene where the Baron visits Louise in her home just before she receives the earrings, the point where neither of them can deny their feelings any longer. Ophuls places a painting of Napoleon's defeat at Waterloo between them, hearkening back to a quip about the infamous military leader that the General made earlier. He told Louise that Napoleon wasn't only wrong at Waterloo, but also when he said, "The only victory in love is to flee" (foreshadowing of what was to come). 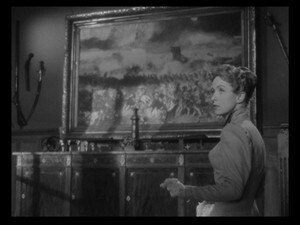 When both actors are in the shot, the painting is perfectly visible between them, suggesting a certain danger that should be avoided; when Ophuls cuts to their close-ups, Ophuls uses perspective shots to make it look like they are each right next to the art, suggesting that the distance is not so great, that the danger is closer than it appears. Compare it to the scene in the carriage later, when they are in each other's arms at last, and where they treat the earrings practically as a sexual fetish. There is no longer any space between. Just how this danger ultimately plays out is partially left to the imagination. Though there is no margin for debate at the end of Louise de Vilmorin's novel, Ophuls ends his movie of Madame de... on an ambiguous note, making for one of the best "did they or didn't they?" endings in cinema. We will never know the exact outcome of the duel or how Louise came through it (though we can make pretty good guesses about both, and I admit, I may be wanting the conclusion to be more vague than it is). Even Louise's prayer at the cathedral is ambiguous. She prays for one of the men to survive the duel, but she never says which. The only thing Ophuls does make clear is the sacrifice she is willing to make, his final shot showing what she will give up in order to find some kind of happiness at last. Note: See also my DVD Talk review of Ophuls' La ronde here. I have also reviewed Le plaisir on my personal blog here. The DVD Talk review of Le plaisir is by Jeffrey Kauffman, read it here. The Earrings of Madame de... is shown in a full-frame 1.33:1 aspect ratio and has been remastered as a 1080p MPEG-4 transfer taken from Gaumont's 2K restoration, created in 2012. There has already been some disagreement amongst aficionados regarding the upgrade, and I tend to side with those who think it is an improvement. Clarity is increased, and the surface texture is more akin to film than previously. I didn't really notice much by way of enhancement or digital glitches, and the general look of the picture is clean and clear with excellent contrast between dark and light. I personally feel confident replacing my Standard disc with this HD one. I don't think there is going to be a similar debate about the soundtrack: the French mono is presented as a new lossless remix with nice volume control and none of the metallic hues I noted the last time around. It's all easy to hear and the subtitles match nicely. 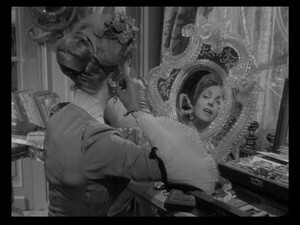 The Earrings of Madame de... Blu-ray exactly mirrors the original DVD version from 2008 in terms of its extras. That includes the 76-page book with the original Louise de Vilmorin novel that the movie is based on, which I highly recommend reading. In addition to that, there are photos, cast and crew credits, a chapter listing, a new essay by film critic Molly Haskell, and an excerpt from a book about Ophuls by his regular costume designer, Georges Annenkov, detailing the creation of the wonderful clothes seen in the movie. The packaging also has the same incredible artwork by David Downton that has been part of all of Criterion's Ophuls releases. The actual packaging is sturdy, with a cardboard case thick enough to hold the book and the disc, and a protective outer slipcover. The BD contains a video introduction of P.T. Anderson (14 minutes, 25 seconds), director of Magnolia and There Will Be Blood. In it, he explains his appreciation of the movie and the work of Max Ophuls. Unlike the Todd Haynes introduction on Le plaisir, Anderson doesn't appear on camera, instead talking over choice scenes, providing a kind of scene-specific commentary. There is also a full-length audio commentary by Ophuls experts Susan White, who did the commentary for La ronde, and Gaylyn Studlar. The two women discuss the film together, sharing their interpretation of what is happening on the screen and explaining some of the background on the film. * Alain Jessua, Ophuls' assistant director, shot in 2005 (25:26). Features vintage photos and press materials. * Marc Frederix, another assistant director working on production design, in a segment from 1989 (8:11). Contains a glimpse at some sketches for the sets. All discuss what it was like to work with the director, and how he arranged his crew just like he would an elaborate scene, each piece in its proper pace. The Frederix and the Wademant excerpts are from the same French program on Ophuls. My favorite of all the supplements is a video essay by Tag Gallagher (17:15). 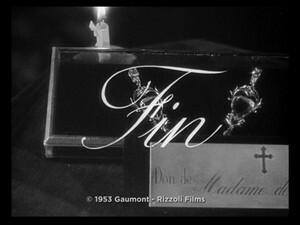 It uses clips from The Earrings of Madame de..., as well as short pieces from other Ophuls films, to dissect the director's editing technique and examine how he uses mis-en-scene to create a greater emotional impact. Gallagher also brings in other artistic influences that may have inspired Ophuls. It's an incredibly illuminating study of the craft of filmmaking, doing what a bonus feature should by giving us a greater understanding and appreciation of what we just saw in the main feature. All the video extras have also been upgraded to HD. Highly Recommended. The Earrings of Madame de... - Criterion Collection is a near-perfect movie and it continues to impress even as it moves into new formats and is remastered with new technology. This lavishly decorated but elegantly written piece is a self-contained story that shows us the sweep of comedy to drama, from flirtation to love affair to the tragic consequences that come from taking a bite of the apple and attempting to cover it up. Following the journey of a pair of earrings from the woman who owns them and through various hands and back to her again, this 1953 Max Ophuls masterpiece details the arbitrariness of fate and the price that comes with desire. Full of great performances and masterly cinematic storytelling, the movie also gets a strong showing in the extras department, making it a grand package front to back. 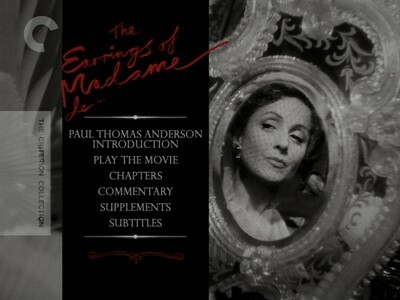 The Earrings of Madame de... - Criterion Collection has swiftly and easily climbed onto my favorites list.